Mila Kunis attended the screening of ‘The Spy Who Dumped Me’ at Hearst Tower on Thursday (July 12) in New York City, which also served as her Cosmopolitan cover party. 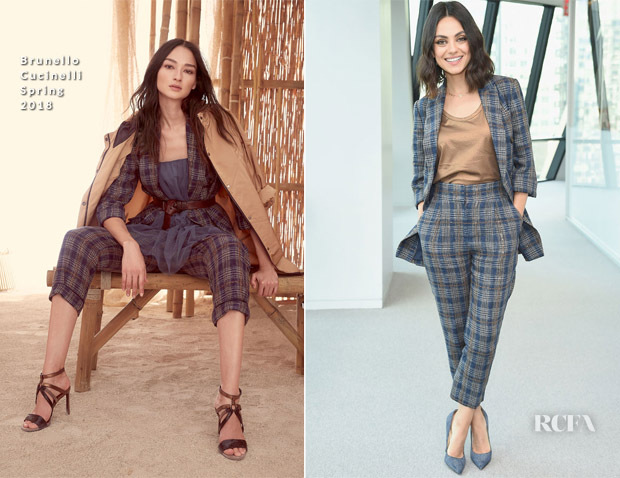 I was delighted to see the actress continue to step outside her all-black comfort-zone wearing a Brunello Cucinelli Spring 2018 suit, that celebrates the heritage check trend with its navy and caramel plaid design. The suit offers up multiple styling opportunities, yet in true Mila fashion, she kept things simple with a silk cami and grey suede pumps.